Thank you for visiting Norfolk Christian Schools! As you browse this site, I believe you will see that God has blessed our school in many ways. Through the legacy of two extraordinary men of God in the 1950s, Norfolk Christian has become a leader in providing Christian Education with excellence in academics and programs. You will get a good understanding of our philosophy and commitment to a Biblical worldview by perusing the information right here. However, to really see the incredible community that is Norfolk Christian, I invite you to see what we do first hand by visiting one of our campuses. We would be delighted to show you what makes the Ambassador life unique. I am honored to welcome you to Norfolk Christian and hope that we may meet in person during your visit. Daniel Tubbs has been Norfolk Christian’s Head of School since 2016, serving from 2013 – 2016 as the Upper School Director. Before joining NCS, he served as Head of School at The King’s Academy in Pennsylvania for eight years and has taught at the middle school, high school and college levels. 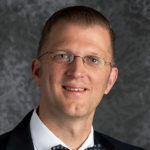 Mr. Tubbs holds Bachelor of Science degrees in Bible and Secondary Education from Cairn University and a Master’s in Education Leadership from Regent University. President, Hobbs & Associates, Inc.